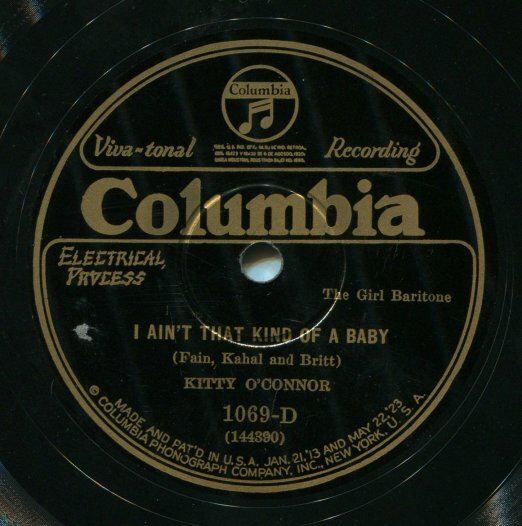 Kitty O’Connor enjoyed brief popularity on the vaudeville and Broadway stage during the 1920s. She was billed as “The Girl Baritone” for reasons you will hear on these recordings. A very odd sounding voice – but she could certainly belt out a song. I especially enjoy the “hot jazz” studio band that accompanies her. This entry was posted in 1920s, 1920s Popular Music, American Recordings, Electrical Recordings. Bookmark the permalink. Literally a “brassy” voice, almost a trombone quality. I wish I could have heard her live.